If you have a high availability Lucene configuration, you can take one Lucene node out of service for maintenance while other Lucene nodes continue to operate. Then you can synchronize the out-of-date Lucene node with the current indexing data. Log in to the Novell Vibe site as the Vibe administrator. Under Search Index, click Nodes. In the list, locate the node that needs maintenance. Make sure that Enable Deferred Update Log is selected. In the User Mode Access box, change Read and Write to Write Only. 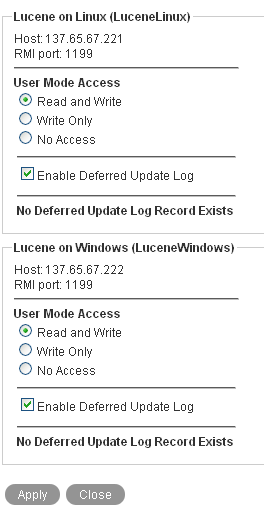 The new setting is put into effect immediately, so that the Lucene node is no longer accessible to Vibe users. Perform the needed maintenance on the Lucene server, then start the Lucene Index Server again. 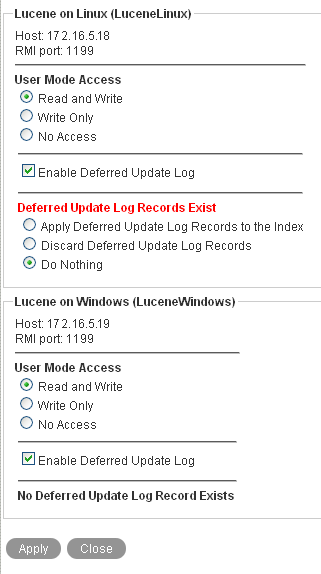 The out-of-date Lucene node is flagged with Deferred Update Log Records Exist. The User Mode Access option shows Read and Write because this is the last selected setting. If you are checking the Tomcat catalina.out file, as described in Observing Lucene Node Activity in Multi-Server Configurations and Clustering in the Novell Vibe 3.4 Installation Guide, Vibe is not actually accessing the out-of-date Lucene node because it is out of sync with the Vibe site. Select Apply Deferred Update Log Records to the Index, then click Apply. The Deferred Update Log options disappear if the update is successful. The Lucene node that was out of service has now been updated with current indexing data.